There have been many changes to my kitchen and dinning area over the last eight months. From replacing the kitchen wall tiles to changing all of the furniture. The end is in sight and now I just need to add one or two items to pull everything together. As of last week it was a type of wall art and creating a photo wall. 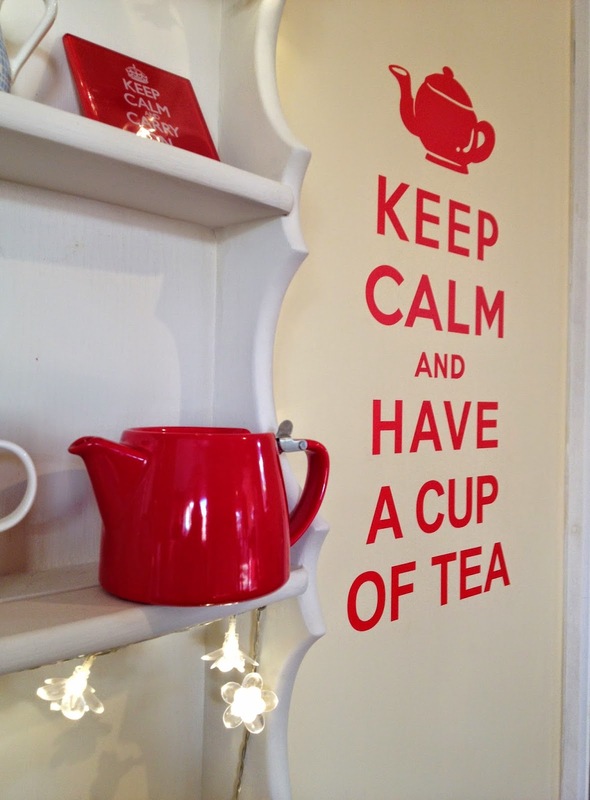 Wall Art - Keep Calm and Have a Cup of Tea! I can now tick off the wall art - hurrah! 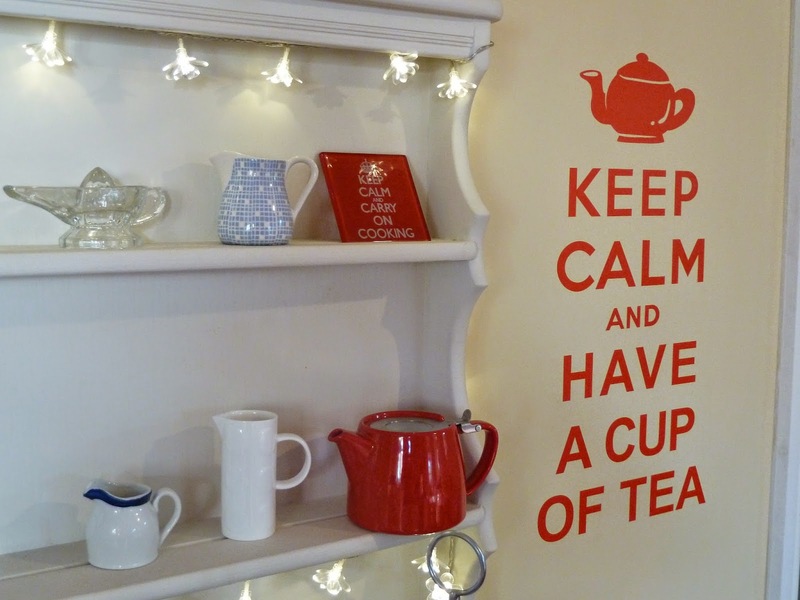 As I have just fitted a fabulous wall sticker which declares to all visitors 'Keep Calm and have a Cup of Tea'. Which sums me up perfectly, I am 'mostly' calm and will mostly be found drinking a cup of tea! What do think? I absolutely love it, at first I thought it maybe too bright in colour but it actually works really well with its surroundings. how easy it is to add impact to a room with such a simple and easy to fit piece of wall art. With plenty of red accessories in the room this wall art really does help to complete the modern yet vintage look I was wanting to achieve. normally when I review an item I usually have a useful suggestion or where there maybe some slight improvement following its use. Everything about this product was as promised, in fact I have been so pleased with it I have been showing my photo of it to all my friends! almost any room in the house, there is a wall sticker suitable for any taste, decor or look. From a fun and funky design for a children's room, to something more relaxed and tasteful for a bedroom or lounge. The Keep Calm and Have a Cup of Tea sticker from My Wall Stickers costs £16.99 and comes is a wide choice of colours, it measures 60cms tall x 30cms wide. Perfect dimensions to be placed to the side of my kitchen dresser and the door to the lounge. The instructions were very easy to follow and fixing it to the wall was very straight forward, with no hiccups. With your wall sticker you receive an instruction leaflet and a squeegee. You will also need some masking tape and scissors, I also used a spirit level as I wanted to be sure it was level. Once it is fixed to the wall there is no re-positioning it, so I did not want a wonky sticker. Guaranteed by the manufacturer for 5 years although likely to last longer. I received this wall sticker free of charge from My Wall Stickers for the purposes of this review, all options expressed are my own. My kitchen could do with a sticker like this. It looks really nice. I wish I had wall space for a sticker like this in my kitchen.